She has told us about witches and the Black Death in the Borders. Now she’s talking about beggars, thieves and whores. 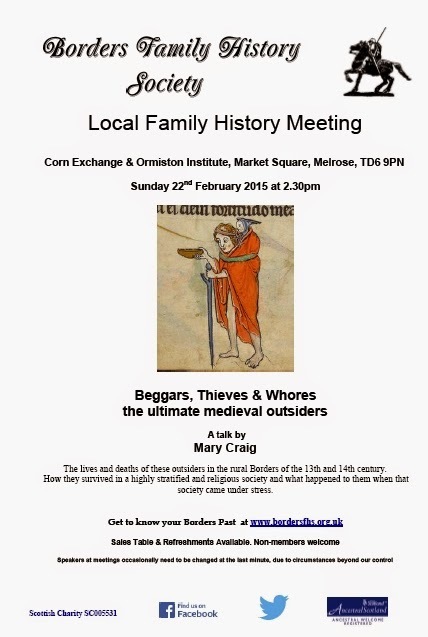 Mary Craig’s style is very lively and entertaining and Mary is going to talk about the lives and deaths of these, the ultimate medieval outsiders in the rural Scottish Borders of the 13th and 14th century. How did they survive in a highly class-structured and religious society ? What happened to them when living conditions worsened ? That talk is this Sunday, 22 February at the Corn Exchange and Ormiston Institute, Market Square, Melrose, TD6 9PN. Map. I’m expecting this to be a very interesting talk and very popular; so come early to get a good seat. I warmly invite you to attend the talk whether you are a member or not. Doors open at 2pm; the talk begins at 2.30pm. We'll have a range of family history publications available to buy, and there’ll be light refreshments (donation expected) available after the talk. If you have a problem with your family history, please discuss it with one of our volunteers. Speakers at meetings occasionally need to be changed at the last minute, due to circumstances beyond our control.